This dish combines the very best of Middle Eastern flavours – silky eggplant, earthy olive oil, pungent garlic and sweet balsamic vinegar. Sure to be the star of any appetizer platter, these balsamic marinated eggplant ribbons can be set out with a spread of olives, feta cheese and sun-dried tomatoes to create fantastic hors d’oeuvres. By grilling the eggplant slices on a panini press (or other counter-top grill), the olive oil is added cold as part of the marinade; this prevents prolonged exposure to heat and unnecessary oxidation. Quick facts: This dish is choc-full of anti-oxidant and anti-inflammatory garlic, as well as olive-oil, a great source of mono-unsaturated fatty acids. What’s more, reducing the balsamic vinegar creates a sweeter, more concentrated marinade for a more complex dish. 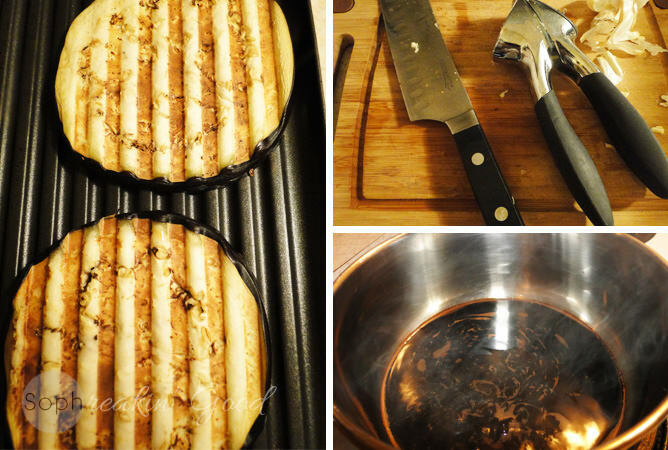 Place eggplant slices on a pre-heated panini press or counter-top grill. Cook for about 5 minutes, or until the slices are soft with golden brown grill marks. While the eggplant is grilling, place balsamic vinegar in a small saucepan and simmer on medium heat until vinegar has reduced by about half and has darkened and thickened in consistency. Mix together olive oil, garlic, salt and pepper in a glass container – place grilled eggplant directly into olive oil mixture once it is ready. Lastly, add the reduced balsamic into the eggplant and olive oil mixture. Use a fork to combine all of the ingredients, breaking apart the eggplant slices slightly while stirring. Cover the container with a tight-fitting lid or plastic wrap and chill in the fridge for several hours, or overnight. 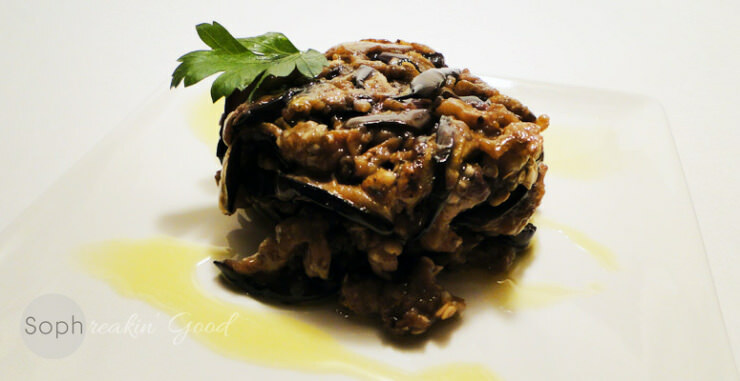 Simple to make and bursting with Mediterranean flavours, balsamic marinated eggplant is sophreakin’ good!